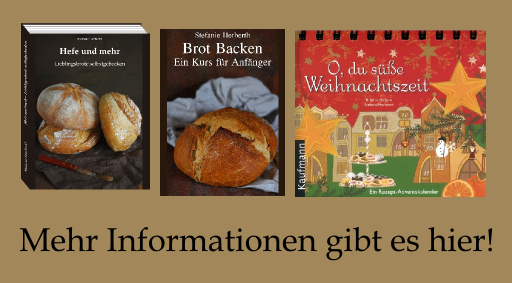 Last year I saw a Christstollen with Sourdough which “Ofenkante” published on his blog. This stirred my brain and I started to think about Stollen made with sweet starter. But as I was already done with Stollen baking at this time point, I stored the idea in the back of my mind. After one year of thinking about it I decided to bake directly two stollen for this Christmas: a traditional and a experimental one. In the experimental stollen with sweet starter I kept the same ratio of ingredients then in my traditional one (never change a winning team) but build the the sweet starter over several steps to get a enough strength for rising. It is always amazing to see how strong the sweet starter gets when fed three times in a row! But as the feeding is time consuming, this recipe needs a day until it is done. After four weeks of ripening I brought the stollen from the cold attic back to the warm kitchen and sliced it. The crumb was perfect, firm but moist and the different flavours had fused to a harmonic consonance. Compared to the traditional stollen there are subtle differences in flavour nuances, but it is hard to pin them down. After all, both of them taste terrific and I can not name a favourite. One thought hits me every year out of the blue at the End of October: Its only a month left till advent! And because my family has the tradition to eat christstollen at the first advent Sunday, I have to start my stollen baking early enough because a good stollen needs two to four weeks storage to develop the perfect flavour! The recipe I use is unchanged since five years and I will use it this year again.And when I stop changing recipes then this means something! 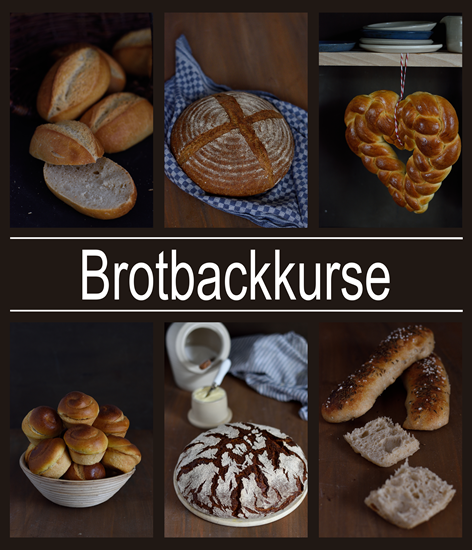 In the last years I collected my recipe, tips and tricks on the blog. 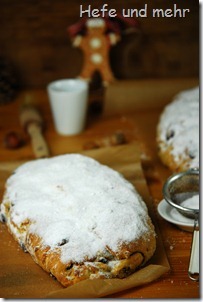 Last year I although added two variants of my stollen which I baked ADDITIONALLY to the traditional one. 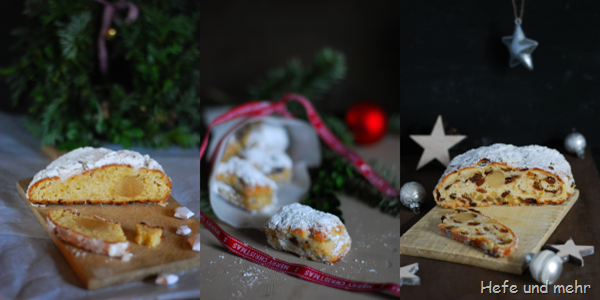 Stollenkonfekt – this is Christstollen baked as little bits. I saw it often in the last weeks in the supermarket. And I thought “I can do some of this delicious bits by my own!” This was the beginning of this recipe. I made some adjustments in my favourite Christstollen recipe, increasing the amount of water roux to prevent drying out in the oven and cutting the marzipan into the small cubes. I halve the recipe so it will yield one tray of Stollenkonfekt. And because the Stollenkonfekt is so small, no one will recognise when you taste one or two still oven warm. They then already delicious, moist and fluffy. That makes it even harder to wait the one or two weeks of rest a stollen needs so the different flavours can infuse and melt together. But the taste is worth the patience. The crumb gets denser during that time and stays incredible moist. 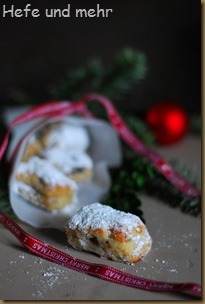 A perfect little bit of stollen in a size which fits on every christmas cookie plate. 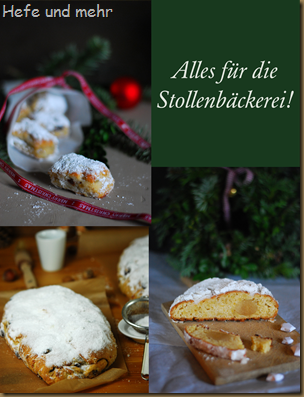 I do not make an changes on the recipe of my Christstollen, but some members of our family do not like raisins, and so they do not like Stollen as well. So an alternative was needed! Years ago I already baked a Almondstollen for them, but Almondstollen always has the tendency to get very dry. And that is not so surprising when you take out the ingredients that keeps it moist like raisins for example! But nevertheless I take the challange once again and baked a Marzipan Almond Stollen this year. The basis for the recipe is the proofed and true recipe of my Christstollen, of course without the raisins and with more almonds. For moisture I use a water roux and added grated Marzipan as well, which adds a nice flavour, too. The fine almond flavour get enhanced from some Tonka bean, and for the classical stollen flavour I grounded candid orange peel in the food processor as fine as possible. There are only two weeks left until the first Advent! So its really time to bake some Christstollen. I baked, without a change (! 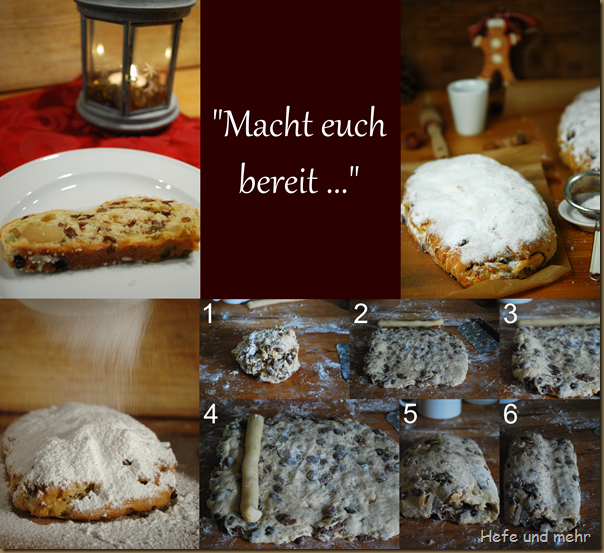 ), my Christstollen recipe – like I did it in the last four years. I know that its unusual for me not to change a recipe, but this recipe did not only convince me but although my gourmet collegues and my unbribable honest father. This christstollen stays very moist due to the water roux I included in the recipe and the spices I use (vanilla, mace, cardamom and cinnamon)makes it very delicious. Only a little bit of patient is needed because the Christstollen should be rest for some weeks before eating it. 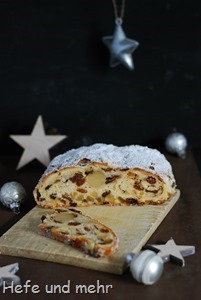 It needs the time so that all aromas can infuse the stollen and merge to a heavenly taste. 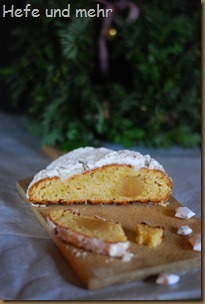 The recipe can be found here and the “How to form a christstollen” can be found here.